ESA PR 60-2004. 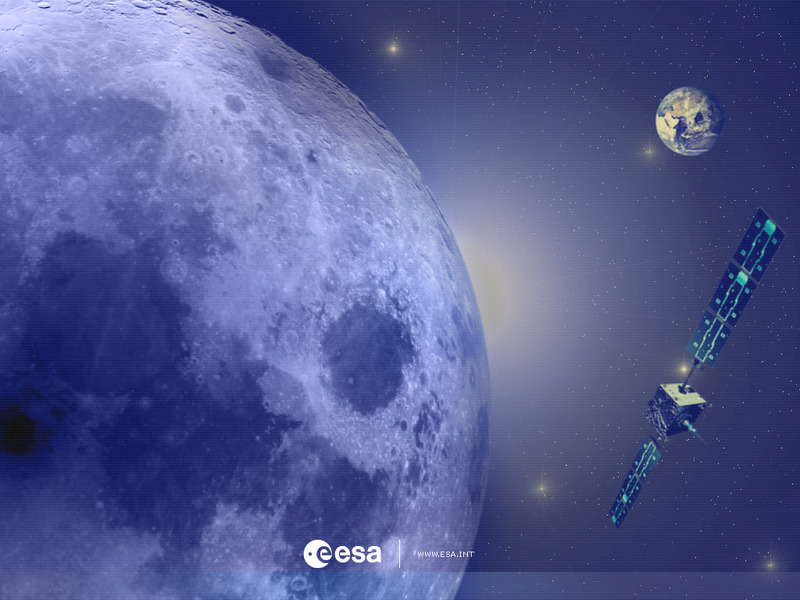 ESA’s SMART-1 is successfully making its first orbit of the Moon, a significant milestone for the first of Europe's Small Missions for Advanced Research in Technology (SMART) spacecraft. A complex package of tests on new technologies was successfully performed during the cruise to the Moon, while the spacecraft was getting ready for the scientific investigations which will come next. These technologies pave the way for future planetary missions. SMART-1 reached its closest point to the lunar surface so far - its first ‘perilune’ – at an altitude of about 5000 kilometres at 18:48 Central European Time (CET) on 15 November. Just hours before that, at 06:24 CET, SMART-1’s solar-electric propulsion system (or ‘ion engine’) was started up and is now being fired for the delicate manoeuvre that will stabilise the spacecraft in lunar orbit. During this crucial phase, the engine will run almost continuously for the next four days, and then for a series of shorter burns, allowing SMART-1 to reach its final operational orbit by making ever-decreasing loops around the Moon. By about mid-January, SMART-1 will be orbiting the Moon at altitudes between 300 kilometres (over the lunar south pole) and 3000 kilometres (over the lunar north pole), beginning its scientific observations. The main purpose of the first part of the SMART-1 mission, concluding with the arrival at the Moon, was to demonstrate new spacecraft technologies. In particular, the solar-electric propulsion system was tested over a long spiralling trip to the Moon of more than 84 million kilometres. This is a distance comparable to an interplanetary cruise. For the first time ever, gravity-assist manoeuvres, which use the gravitational pull of the approaching Moon, were performed by an electrically propelled spacecraft. The success of this test is important to the prospects for future interplanetary missions using ion engines. SMART-1 has demonstrated new techniques for eventually achieving autonomous spacecraft navigation. The OBAN experiment tested navigation software on ground computers to determine the exact position and velocity of the spacecraft using images of celestial objects taken by the AMIE camera on SMART-1 as references. Once used on board future spacecraft, the technique demonstrated by OBAN will allow spacecraft to know where they are in space and how fast they are moving, limiting the need for intervention by ground control teams. SMART-1 also carried out deep-space communication tests, with the KaTE and RSIS experiments, consisting of testing radio transmissions at very high frequencies compared to traditional radio frequencies. Such transmissions will allow the transfer of ever-increasing volumes of scientific data from future spacecraft. With the Laser Link experiment, SMART-1 tested the feasibility of pointing a laser beam from Earth at a spacecraft moving at deep-space distances for future communication purposes. During the cruise, to prepare for the lunar science phase, SMART-1 made preliminary tests on four miniaturised instruments, which are being used for the first time in space: the AMIE camera, which has already imaged Earth, the Moon and two total lunar eclipses from space, the D-CIXS and XSM X-ray instruments, and the SIR infrared spectrometer. In all, SMART-1 clocked up 332 orbits around Earth. It fired its engine 289 times during the cruise phase, operating for a total of about 3700 hours. Only 59 kilograms of xenon propellant were used (out of 82 kilograms). Overall, the engine performed extremely well, enabling the spacecraft to reach the Moon two months earlier than expected. The extra fuel available also allowed the mission designers to significantly reduce the altitude of the final orbit around the Moon. This closer approach to the surface will be even more favourable for the science observations that start in January. The extra fuel will also be used to boost the spacecraft back into a stable orbit, after six months of operations around the Moon, in June, if the scientific mission is extended. Ion drives: Science fiction or science fact?